Quilting Adventures: It's been way toooooo lonnnnng.....! Life continues to be busy. I must admit, I love my work schedule. Five (5) days on (with a 2 (two) day break in there) and seven (7) days off! Couldn't ask for a better work week! What have I been up too you might ask? Lots of quilting that's for sure. I did play some more on Penelope, practicing my feathers. They're coming along nicely! Not ready to put them on a quilt yet... soon with more practice. I did finish a top that's presently on Penelope. I used some reproduction fabrics! I want to have it machine quilted before I blog about it. I'm presently waiting for some thread! That order should get here in a couple of days! I did finish block 9 (nine) of Hocuspocousville! I love that pattern. Meg from Crabapple Hill did come out with a new Halloween pattern called Vintage Trick or Treat. That's another one on my list of to dos! I love her work! We were talking/writing about making pasta. I was telling her about the special adapter that attaches to the mixer. Anyway, by the end of our discussion, I knew what I wanted for dinner! 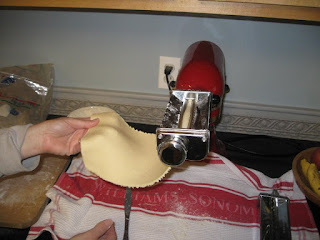 I just love fresh pasta and this special gadget makes it so much easier. Both hands are free to play with the dough. I make my pasta dough using semolina flour that I purchase in Montreal. Nothing like that around small town USA. You can make it with flour, but I prefer to use semolina. I knead my dough using setting 1 and then 2. After I feel it is properly kneaded, I go through the various numerical settings to thin it out. Once the dough is thin enough for my liking, in this case number 5, I pass it through the fettuccine cutter. There's also a spaghetti noodle adapter that comes with the set. That night, you guessed it, we were having Fettuccine Alfredo! Yummy! 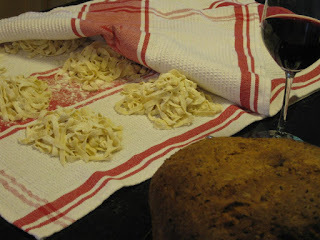 Fresh pasta, fresh artisan whole grain loaf and a glass of red wine! Oooh, I've lusted after one of those pasta makers. Are they hard to clean up? That's my only worry - gadgets are sometimes more work than they're worth! YUMMERS!!!!!!!!!!!!!! I'm on my way for dinner! There's nothing better than fresh pasta. I was wondering where you were....thought you might be buried under bolts of fabric at the shop. :) Supper sounds wonderful.....glad to see you are enjoying yourself. Boy....does that sound yummy. I, too, love making bread. There are few things so satisfying as a freshly kneaded loaf ready for rising and baking. Oh....did I mention THAT smell????? That attachment for the mixer looks great. The hand crank pasta makers are more of a two person job!! We have on made the pasta once so far but I think once the kitchen reno is done we will be making a lot more pasta - so yummy. How is the store doing? Lots of fun I bet! The fresh pasta looks great - I love the texture of it. We can get fresh Asian noodles here which are yummy in chicken noodle soup. Love your hocuspocusville block - can't wait to see how you put it together! Yummy, mmmmmmm. 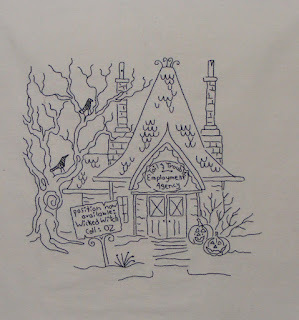 The Vintage Trick or Treat stitchery is fantastic. I have the pattern for the embroidery Halloween quilt, have not made too much progress yet. I love your blocks, though! I looked at the Vintage pattern, and love it too. TOOOOOooo many want-to--dos! I am so impressed. Can I come to dinner? Looks yummy! I hope you're enjoying your venture! 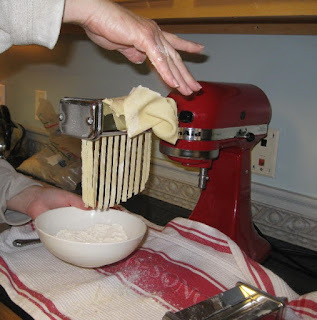 OMG your making fresh pasta??? Look at you go!!! !